The Indian Ocean Naval Symposium (IONS) is an extremely significant regional maritime security initiative which was launched by India in February 2008 to attain collectively beneficial maritime security outcomes within the Indian Ocean by providing an open and inclusive forum for discussion of regionally relevant maritime issues. IONS endeavours to generate a flow of information among naval professionals resulting in common understanding and possible agreements on the way ahead to tackle common concerns. The outcomes of the discussions could thereafter be implemented through agreements to enhance of regional maritime security. South Asia: Bangladesh, India, Maldives, Pakistan, Seychelles and Sri Lanka. West Asia: Iran, Oman, Saudi Arabia, UAE, Bahrain, Iraq, Kuwait, Qatar and Yemen. East African: France, Kenya, Mauritius, Mozambique, South Africa, Tanzania, Djibouti, Egypt, Eriteria, Comoros, Madagascar, Somalia and Sudan. South East Asia & Australia: Australia, Indonesia, Malaysia, Myanmar, Singapore, Thailand and Timor Leste. The 10th anniversary commemorative activities of the IONS were held on the November 13 and 14, 2018, at Kochi. 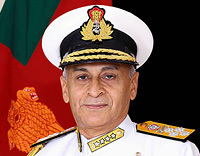 Admiral Sunil Lanba, Chairman Chiefs of Staff Committee and Chief of the Naval Staff (CNS), was the Chief Guest for the inaugural event, the IONS Seminar, scheduled on November 13, 2018, at the Lulu Bolgatty International Convention Centre, Kochi. The Seminar was attended by Chiefs and senior representatives from the navies of the majority of member nations. In line with the vision of the Prime Minister, Narendra Modi – ‘SAGAR’ (Security and Growth for All in the Region) - the theme for the 10th anniversary seminar was “IONS as a Catalyst for SAGAR”. ‘SAGAR’ is in consonance with India’s ‘Act East’ policy and the nation’s diplomatic, economic and military outreach in the region. 26 of the 32 countries which constitute the total membership of IONS participated in the Seminar which aimed to discuss maritime issues pertaining to cooperative capacity-building to deal with common security concerns in the region. The IONS initiative endeavours to generate a flow of information among naval professionals so as to enable a common understanding of regional maritime issues and in turn facilitate generation of mutually beneficial maritime security outcomes. 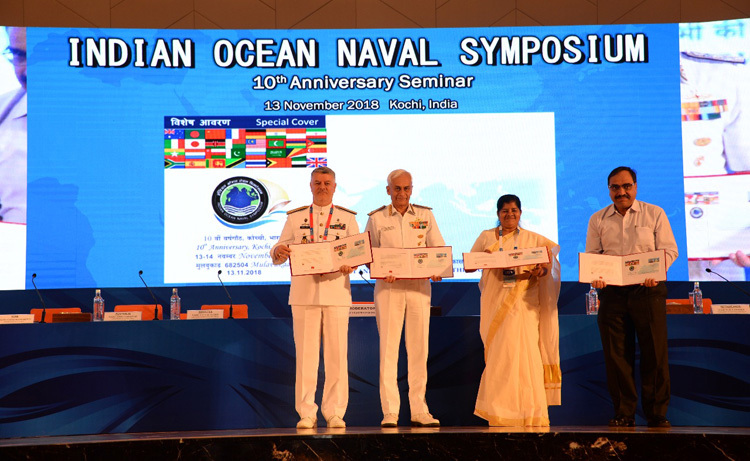 During the Seminar, CNS released of the ‘Special Cover’ designed to commemorate the 10th Anniversary of IONS at Lulu International Convention Centre, Kochi in the presence of Fisheries, Harbour Engineering and Cashew Industries Minister of Kerala, Mercy Kutty Amma, the Post Master General PMG, Northern Region, Shri Jithendra Gupta and the Commander of Islamic Republic of Iran (IRI) Navy Rear Admiral Hossein Khanzadi. The commemorative Special Cover of IONS 10th Anniversary celebrations depicted a map of the Indian Ocean and littoral countries of the IOR, signifying the geopolitical importance of the region. It also has a sail-boat that majestically symbolises the importance of ancient trade routes used by the natives of the region to establish trade and socio-cultural links with the countries in the region. The national flags of member nations form an integral part of the cover and symbolise the support and cooperation of these countries the common cause of maritime security, goodwill and growth in the region. Chiefs of Navies of Bangladesh, Iran, Japan, Madagascar, Maldives, Mauritius, Mozambique, the Netherlands, South Africa and the UAE as well as senior delegates from 16 other IONS member nations attended the IONS celebrations. The release of the Special Cover was followed by a Seminar during which eminent guest speakers exchanged views on the ways to address emerging maritime threats in the IOR, leverage the IONS for better coordination and resource sharing, and enhances Maritime Domain Awareness in the region. A total of 16 papers were presented over three sessions. Bilateral meetings among Chiefs of participating navies were also held on the sidelines of the seminar wherein issues of common concern were discussed. Admiral Sunil Lanba, along with the Commander of Islamic Republic of Iran Navy, Rear Admiral Hossein Khanzadi flagged off a “Tall Ship Sail Together” from Naval Base, Kochi on November 14, 2018. The Royal Omani Vessel Zinat-al-Bihaar along with two Indian Naval Sailing Ships Sudharshini, Tarangini, with one each “Sea Rider” from Sri Lanka, China, United Kingdom, Australia, Bangladesh and Maldives are participating in this ‘Sail Together’ which is planned over a distance of 1,200 nm to Muscat and back. It seeks to retrace the maritime trade route of yesteryears between the Malabar Coast and the Persian Gulf. The ships were accompanied by smaller Indian sailing vessels Mhadei which would be heading towards Seychelles while the others would continue towards Muscat. A grand fly past with nine helicopters and three fixed wing aircraft was undertaken to mark the occasion. The event carried with it the memories of a glorious maritime past and the ancient cultural exchange that opened long-distance political and economic relations between the great civilisations of India and those in Persia and Arabia. The route also honours the sociocultural and maritime history that is shared among populations across the Indian Ocean as a result of this trade. To have Kerala as the starting point for the sail-together is both appropriate and befitting. Kerala’s coastal magnificence has been a legendary maritime hub for traders from across the world dating all the way back to the first century AD. Its majestic shipyards known by the iconic Urus, have been in the midst of intense ship-building and maritime trade over 1,500 years. Arab traders were especially captivated by these vessels and were among the first major patrons of these boats. The ‘Sail Together’ would culminate with the Tall Ships being received at Muscat on November 29, 2018. On the sidelines 10th Anniversary of IONS, CNS announced that the Indian Navy was all set to open an international Information Fusion Centre (IFC) for IOR aiming to improve maritime security in the region. The IFC will be a separate platform for the members of the IONS. “We have the approval from the Government of India to get in touch with a number of nations on technical agreement on exchanging information on white-shipping. We have signed agreements with 18 countries and operationalised 11 of them, where online information exchange on white-shipping has started. All this is put together in the Indian Navy’s “Information Management and Analysis Centre” (IMAC) at Gurugram. 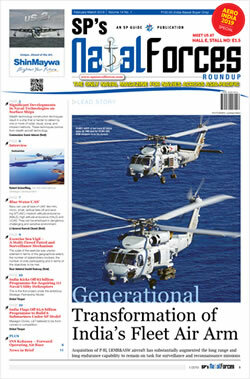 To start with, we are going to set up the IFC as an adjunct to the IMAC where we will share information virtually with like-minded countries and once we have infrastructure in place we will invite other countries” Admiral Sunil Lanba stated. White-shipping refers to commercial shipping. Dismissing the allegations that the Indian Navy has not been responsive in helping the fishermen in distress during the Cyclone Ockhi and the mid-sea collision in which five people died and seven went missing, CNS clarified that the Indian Navy has done its best. “During Ockhi, the Navy and the Coast Guard picked up hundreds of fishermen under severe weather conditions. We went out of the way and continued search and rescue operations for more than 40 days. In the case of mid-sea collision, we conducted search for days together. We deployed underwater survey vessels to find the sunken boat, but could not find it. We presume the missing fishermen were caught in the sunken boat,” he said. Responding to a question on initiatives taken by India to overcome growing Chinese influence in the Indian Ocean, CNS said a mission-based deployment of Indian Naval ships has been undertaken in “our areas of interests”.